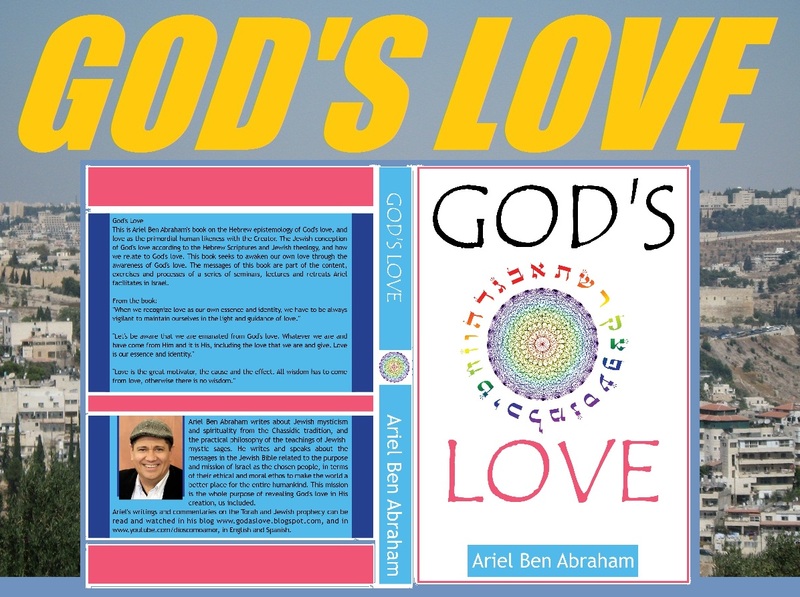 Ariel Ben Avraham's book on the Jewish conception of God's love according to the Hebrew Scriptures and Jewish theology. How we relate to God's love as our common bond with Him. You can order the book directly from the author at godaslove@gmail.com. From the book: "Let's be aware that we are emanated from God' love. Whatever we are and have come from Him and it is His, including the love that we are and give. Love is our essence and identity." We have reflected on two aspects of our relationship with God in our previous commentaries on Shelach. One is our trust in Him and His Love (Parshat Shelach: Trusting God's Love on May 30, 2010), and choosing with our own free will to walk in His ways and attributes (Parshat Shelach: Directing our Life in God's Love on June 12, 2011). These two aspects are essential to realize our connection with Him. The events recorded in this portion of the Torah are indeed timeless because then and now we face the same dilemma and challenges in regards to knowing who we are and the purpose of our lives as Jews. 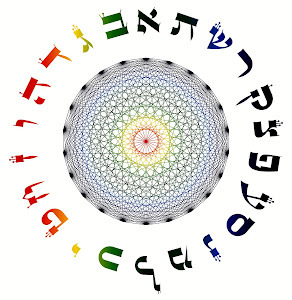 We have said that the Jewish identity encompasses multidimensional facets contained in the twelve Tribes of Israel, and these facets are aimed to manifest all the potential goodness in human consciousness. This process must occur as a united and cooperative endeavor. This is why our Creator instructs Moses (our highest awareness of Him) to guide and direct all dimensions of consciousness in the journey to settle in the potential goodness of who we are, the Promised Land. In the awareness of our individual and collective diversity, we know that such diversity is expressed differently regarding their purpose. The way a warrior expresses himself is quite different from the healer, the priest, the merchant, the judge, the artist, the shoemaker, and the wanderer, to mention only a few. This does not mean that the warrior can't dwell with those who don't do what he does. As a united Israel, we all are part of the multidimensional identity that defines us as Jews, and as such we are destined to fulfill our unity as the Creator wants us to. We must explore the qualities or “territories” of our Tribes, their potential and resources to manifest God's ways and attributes as Love's ways and means to create a place for Him to dwell with us. In the material world, under the dictatorship of ego's fantasies and illusions and their negative trends, we find that our territories are occupied by “peoples” and “nations” that deny the goodness that we want to sow and reap in every aspect of consciousness. Interestingly, we have a similar situation nowadays seeing declared enemies occupying our Land and virtually living in our home. Our benevolence and tolerance for our enemies are actually considered by them as aggression and oppression. This is the consequence of letting our consciousness cohabit with enemies. Once we eradicate them from our Land, our home, we will be able to fulfill our destiny. The only way to do this is by being together and united for the common purpose of realizing our Jewish identity as the means to proclaim God's will in the material world. Caleb from the Tribe of Judah was the only one who, by his own conviction, faithfulness and loyalty to the Creator, realized the extraordinary goodness of the Promised Land and confronted his peers with their negative report on the Land: “The Land that we passed through to explore, the Land is very, very good!” (Numbers 14:7). We must approach the material world with the potential goodness we can manifest from it and for it, because this is the approach that God wants from us. This is what identifies us as Jews, as the Chosen People. If we have a negative conception and attitude about life and the world, we certainly deny any goodness in them. This is the reason that made Judah prevail over the other Tribes. The descendants of Judah chose to remain loyal to the identity that God gave to Israel in His Torah. This faithfulness and loyalty also compelled another descendant of Judah, Nachson son of Amanadav, to become the first to jump into the divided waters of the Sea of Reeds, taking himself into a journey in which the only guide is God's Love. This is the awareness needed to settle in the Promised Land, in the extraordinary goodness of Love's ways and attributes as the only means to remove darkness and negativity from human consciousness. Caleb was aware of the weakness that ego's fantasies and illusions produce in our consciousness. In illusions all becomes uncertain, vain, ephemeral and futile, because that is their nature. We must clear our consciousness from darkness in order to allow Light to occupy all dimensions of life, and we do that by embracing God's Love as our Essence and true identity. Caleb knew the dangers of material illusions and he needed to reaffirm his Jewish identity in order to remain strong in his awareness of God's Love, hence he went to pray by the graves of our Patriarchs in Hebron. There he infused himself with the meaning of his identity as the legacy of the Covenant of Abraham, Isaac and Jacob with the Creator. Thus we must know from where we came and our history in order to fully realize who we are. We are weak when we ignore who we are, and our strength depends on what we are, have and are able to accomplish. Negative thoughts, emotions, feelings and passions can become real giants that may overpower us at the time when we have to choose between them and Love's attributes. It can be easier to become indifferent, greedy, coveting, lusty, envious, indolent, and neglecting, when the feeling of lack takes over our consciousness. Then we find extremely hard to recognize and embrace our identity. In our identity lies our Essence and strength to elevate ourselves to the high level of extraordinary goodness in life: “Caleb silenced the people towards Moses and said, 'We shall surely ascend and conquer it, for we can surely do it!' But the men who have ascended with him said, 'We can not ascend to that people for it is too strong for us! '” (13:30-31). The negative aspects of consciousness indeed can be stronger than our will to defeat them, and it depends on us to change that predicament. Negativity can destroy the best in us: “(...) is a land that devours its inhabitants!” (13:32). We discover our relationship with the Creator in the identity that He forged for us as His People. We come to know who we are in His ways and attributes, because He wants us to emulate them. God's Love is the source and strength of our life, and with Love we empower all levels and dimensions of consciousness to conquer the hardships and difficulties from ego's fantasies and illusions. The goodness of Love's ways and attributes is our Promised Land. Let's reexamine our ancestral memory, intellect, feelings, emotions and passions. Let's wake them up to our true Essence. Let us engage in the delightful awareness of Love as the Essence of G-d. The way this book is written is to reaffirm and reiterate its purpose, so it presents its message and content in a recurrent way. This is exactly its purpose, to restate the same Truth originally proclaimed by our Holy Scriptures, Prophets and Sages. Our purpose is to firmly enthrone G-d's Love in all dimensions of our consciousness, and by doing it we will fulfill His Promise that He may dwell with us on Earth forever. Let's discover together the hidden message of our ancient Scriptures and Sages. In that journey, let's realize Love as our Divine Essence, what we call in this book the revealed Light of Redemption in the Messianic era. Ariel Ben Avraham (f. Zapata) was born in Cartagena, Colombia in 1958. 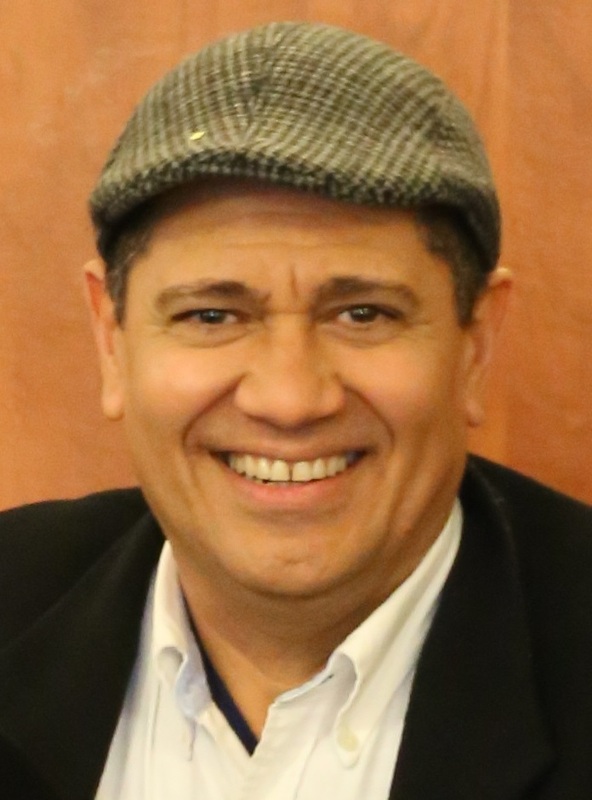 After studying Cultural Anthropology in Bogotá moved to Chicago in 1984 where he worked as a television writer, reporter and producer for 20 years. In the 1990's he produced video documentaries related to art, music, history and culture such as "Latin American Trails: Guatemala" distributed by Facets.org. Most of his life he studied ancient spiritual traditions and mysticism of major religions, understanding the mystic experience as the individual means to connect with the Creator of all. Since 2004 he studies and writes about Jewish mysticism and spirituality mainly derived from the Chassidic tradition, and the practical philosophy of the teachings of Jewish mystic sages. The book "God's Love" is the compilation of many years studying and learning Jewish mysticism. The messages of his book are part of the content, exercises and processes of a series of seminars, lectures and retreats that he facilitates in Israel.